Join Kimberly along with three of her fellow Tranquil Space teachers for a 4-week e-course outlining ways to live the yoga lifestyle with tranquility. This e-course will allow you the opportunity to explore the yoga lifestyle in depth from four of Tranquil Space’s talented teachers. The four sessions focus on healthy and mindful eating, creative expression, pranayama, anxiety reduction, asana, and living your yoga philosophy. Read the private blog and go through the videos and podcasts at your own pace – there is no start or end date. Take time for the OMwork and pick up the recommended sources to dive deeper into the topics. Post pictures from your journey on our Flickr page. You are encouraged to commit to a daily spiritual practice such as yoga, running, meditation, prayer, or nature walks – whatever resonates most with you while taking the e-course. 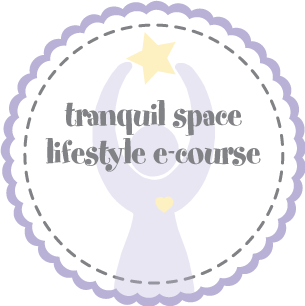 Tranquil Space Lifestyle e-Course is recommended for beginner and experienced yogis looking for ways to infuse yoga into their everyday or non-yogis interested in living a more mindful lifestyle. Join us on this adventure and let the tranquility unfold. Investment: $99, approximately 5-10 hours to listen to podcasts, watch videos, and read musings.